80% Iberian pork loin. Produced in Granada and cured in our drying houses. 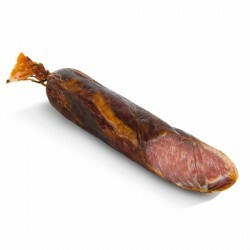 This cured meat is produced with Iberian pork crossed with Duroc breed. The meat is finely minced, making it stand out from other products. Weight 400 g to 500 g.
80% Iberian pork loin. 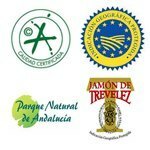 Produced in Granada and cured in our drying houses in Trevélez. 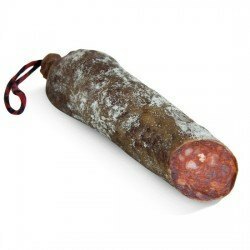 This cured meat is produced with Iberian pork crossed with Duroc breed. The meat is finely minced, making it stand out from other products. Weight 400 g to 500 g. PRICE PER PIECE. Cured pork loin produced with certified Iberian pig breed, containing a high degree of marbling, natural spices and low salt content. Cured for at least 5 months in the drying houses. Very mild flavour. Approx. weight 500 g to 600 g. PRICE PER PIECE.